For a tree that is sturdy and vivacious, usual environmental circumstances will only call for periodic pruning and other basic care techniques. Regular upkeep helps to maintain tree health and its capability to flourish. However, conditions can arise that will render regular, systematic maintenance processes useless. Certain aspects of nature may damage the tree to the point where skilled aid is needed to prevent a hazard. When trouble comes knocking at your door, don’t be afraid. Family Tree Services is a leader in the industry of tree care. We have committed professionals that possess the expert knowledge your tree needs to remain standing for years. Our job is to empower the residents of Asheville, North Carolina through the application of proper tree care. Our aim is to diligently serve your trees so that they can in turn serve you. Family Tree Services offers great services that are supported by science. Also, we will only send you qualified specialists to do any job. Merely sending workers to your home to perform careless work is not an option for us. On the day of your appointment, our company will provide you with top-notch tree surgeons (also referred to as an arborist). These pros are highly skilled at applying all-purpose along with detailed methods for caring of trees. 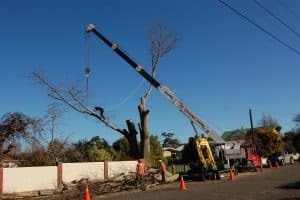 Tree surgery includes a wide array of practices. Let’s talk about some of them. The uppermost part of a tree is known as its crown. It includes the leaves and branches. The practice of tree surgery involves skills that are related to the crown. One of the common tasks for a tree surgeon is known as crown reduction. If the top of a trees gets too big, it presents a good reason to perform this procedure. Whenever the canopy of the tree grows too large in size, safety becomes a concern. Crown reduction is usually completed by trimming the limbs to make them all even in size. If any dead wood or limbs that are rubbing together are noticed, they must be clipped or completely removed. This will lessen the risk of tree infection and disease. The option of crown thinning may be something you’re interested in for cosmetic reasons. This technique includes eliminating certain branches from the inside of the crown. Crown thinning is advantageous because it lets additional light and air move through the tree’s canopy. The second value of this procedure is that it doesn’t cause any drastic changes to the tree’s shape. It also greatly decreases dead spots on your lawn from decreased sunlight. You may often have get-togethers underneath your tree. If people don’t gather under the tree, multiple vehicles may park under it. In either case, low hanging branches may require that crown lifting services be done for you. With crown lifting, select tree limbs are removed from the bottom of the crown of the tree. The result is the appearance that the crown has been raised. Ultimately, more space is created at the bottom of the tree. Trees are structures that can be large and in charge. However, there are instances when a number of branches can develop in one confined area of the tree trunk. As a result, the entire tree can become weak due to the unbalanced weight. As this problem extends over time, a hazardous situation can occur. When an issue like this presents itself, always remember that Family Tree Services has a solution. One of our tree surgery domains is in cabling & bracing. Bracing tools consist of either rods or bolts that are threaded together. They can be used to strengthen a weakened tree crotch, fuse together a trunk that has separated and link together (or pull apart) branches that are rubbing together. The main purpose for cabling is to reduce tension on bigger branches. A bendable steel cable is linked between the branches to provide support as well as minimize movement. This can prevent large branches from falling and causing massive damage or injury. Cabling & bracing are critical services that can save trees and the lives of people. 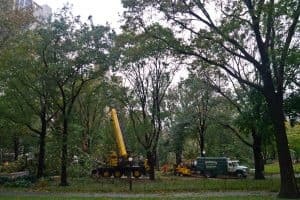 The health of trees and the safety of people in Asheville, North Carolina are our main concerns. Tree structure analysis is a method that arborists use to determine and correct existing endangerments. Broken branches or dead leaves may be recognizable signs of tree damage that many people can quickly spot. However, the eyes of a skilled tree surgeon are needed to complete an adequate tree structure analysis. Evaluating the structure of a tree is done over four different zones. Inspection of zone 1 is a general overview of the tree. Zone 2 involves analyzing the bottom of the tree at the base. Zone 3 includes profiling of the tree trunk. The last part of the evaluation includes the tree’s crown which is zone 4. When beginning the examination, the assessor must place themselves in a position where the whole tree can be viewed. No specific part or section of the tree is focused on during zone 1 inspection. A major portion of zone 1 assessment involves checking for tree leaning. If it is determined that the tree is not standing completely upright, the examiner must then figure out how long the tree has been leaning. Depending on which direction the tree is leaning, the potential hazard can pose a greater threat. A tree leaning in an eastern direction has a greater risk of falling as winds blow from the west. The base of the tree and the surrounding ground area are where zone 2 inspection takes place. Here is where a tree surgeon will inspect the roots to ensure that the tree has proper anchoring. A tree can appear to be the picture of health after zone 1 assessment has been completed. However, root issues can mean that problems with the tree are on the horizon. The trunk of the tree is the sole focus for zone 3. Extra care must be taken during this part of tree structure analysis due to the fact that the trunk supports the entire tree and its branches. Any areas of the trunk that do not have bark are indications that those areas of the tree have died. The usual culprit is fungus. Trees that have more than one trunk present a very unique and extreme situation. Trees with multiple trunks require more routine inspection at the area where the trunks join together. If there are any visible trunk cracks, safety methods must be employed to prevent a possible tree disaster. Within zone 4, focus turns to the tree crown. During this part of the inspection, the goal is to find any dead tree branches. Family Tree Services can quickly locate and remove any dead limbs in a safe manner to prevent harm to people or their property. We hope that you are now more knowledgeable of the intricacies and seriousness of tree care. The Family Tree Services staff genuinely cares about the relationship between you and your tree(s). It is our honor to be able to provide a service that gives you a more beautiful, yet safer world.